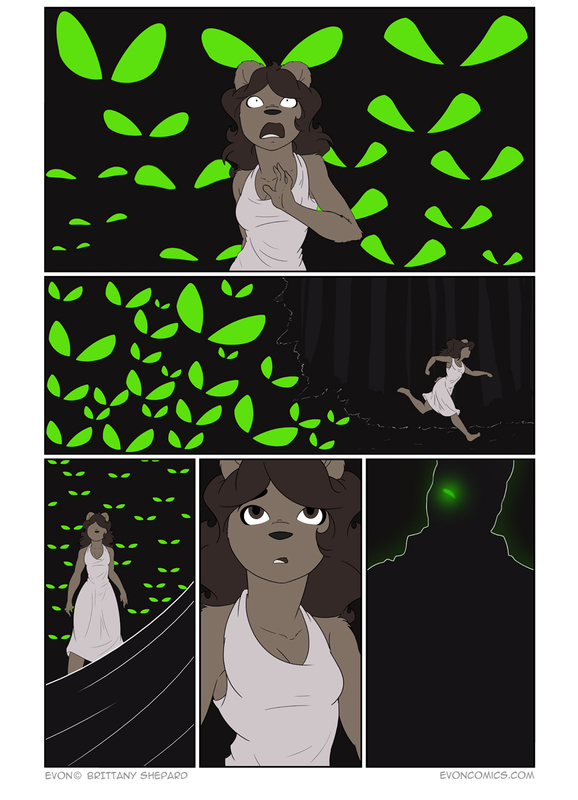 Off my death bed now, a new page of Evon will be up Friday! Wake up, girl. You’ll be fine if you just wake up! The last panel looks like Hero. But, is it? my first impression as well… right down to the head tilt. This guy doesn’t have knives for fingers on one of his hands, does he? It’s no good at all when sleep is only a nightmare. They’re not eyes! They’re glowing winged butterflies! sure seemed to change into them, that’s true. they weren’t at first, but this is a dream, after all. I bet Hero is trying to wake her up. that would explain the last panel. Didn’t I see these in Disney’s Alice in Wonderland? I this guy a psychic? you mean the ‘witch hunter’ the lioness tried to hire? I think he would have to be or at least special enough to get through mages’ magic barriers and such. I didn’t think this was Hero, but the first thought was that this shadowy figure was the hunter. After a little thought, I agree his profession would make him quite… resistant… to magic. My opinion was (and is) the fact that dreams and other involuntary psionic incidents CAN NOT lie. If the ‘witch hunter’ is invading (for lack of a better word) her mind, he is getting a very truthful and thoughrough ‘read’ of who she is and what she is. He’s honorable enough to maybe JOIN her and hero in their endeavors, but he won’t oppose them. Beware the Witch Hunters! They steal your dreams! It’s all good, you have all the time in the world for another update, feel better and relax! but in the meantime you have done wonderful so far with this comic, I am enjoying every page! I’m sorry to hear you’re not feeling well, Brittany. Take your time getting to feeling better. One’s health is more important than updating a comic. If I started publishing my writing online, I’d place my health above my writing. You tend to live longer that way. LOL. Very glad you’re better, Brittany! Hint: sleep in the LIVING room instead! I’m glad you’re feeling better, Brittany. Feeling ill isn’t fun at ANY age, I should know, I’m 61. It ain’t fun at my age and it wasn’t when I was young, like you. Take care of yourself. I’m concerned about Evon. I’m hoping she’ll survive THIS attack. LOL.